In a town with 350 days of sunshine a year, outdoor activities sound like the perfect match. This is evidenced each year when Tuscon hosts not one, but three (!) major league baseball spring training camps. More than a place for professional athletes, Tucson is also a great destination for golfers, hikers, cave explorers, and cyclists. With over 1000 miles of bike trails, Tucson has something for every rider. Here we’ve profiled our favorite Tucson bike trails for families looking to get out and enjoy the sunshine. Just don’t forget your sunscreen! A popular way to enjoy Saguaro National Park is by biking around one of their scenic loop drives. The Cactus Forest Loop Drive in the Rincon Mountain District (east) is an 8-mile paved loop. The Bajada Loop Drive in the Tucson Mountain District (west) is a 6-mile gravel loop. If driving to the park you’ll want to make sure to check the gate schedule, but you can walk or bike in 24 hours a day. Always bring plenty of water as the weather can get quite warm and water is not available on either loop or in the picnic area. 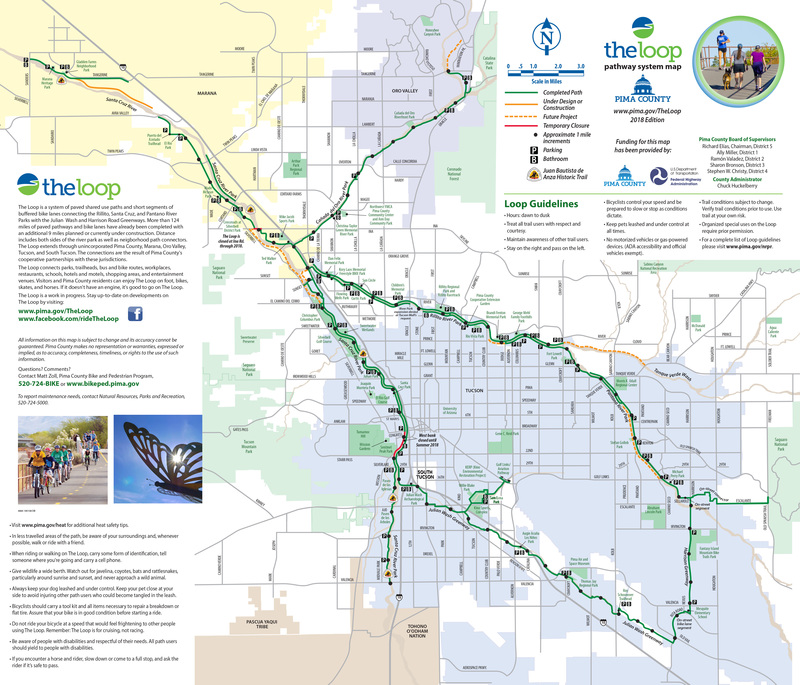 With more than 130 miles of shared-use trail connecting the Tucson metro area, this trail is a great way to get around the city. Even though the path is in the metro area you’ll want to watch out for wildlife including javelina, coyotes, bats, and rattlesnakes. The plethora of parks and close proximity to restaurants makes this path ideal for those looking to get outside for a short destination ride. Check out this map of the complete trail system to start planning your outing. This path runs along both sides the Rillito River for just under 22 miles. The path is paved and there are several bridges crossing the river so you can choose your own route. While the trail is separate from cars, you may see runners, inline skaters, and even horseback riders along the way. Restrooms and water fountains are located at several points but we recommend bringing your own water just in case. The best times to visit are early morning and sunset as there is very little shade. Get a map here to view the trail. Following the (you guessed it!) Santa Cruz River, this paved trail spans 41 miles. At times the trail is offered on both sides of the river, while it merges at other points. Make sure to grab a map of the trail so you can plan your perfect route. The flat trail separated from cars is perfect for little ones learning to ride or a family testing out their new bike trailer or child bike seat. Stop off at one of the many parks along the way for a break or picnic. Reid Park is a great place to go and enjoy the outdoors with the family. Cycling around the paved perimeter of Reid park completes a loop of just under 2 miles. If you continue on to bike around the Randolph Dell Urich Golf Course you’ll gain another mile. With plenty of green grass and shade from trees in the park, you’ll feel like you’re riding in an oasis. Bring Fido along for some fun in the dog park once you’ve completed your ride. Then marvel at the diverse selection in the rose garden – they have over 100 species and 800 individual plants! Whether it’s your first time out or you’re an experienced cyclist Tucson has the perfect bike path for you. And, because of the great network of Tucson bike trails in downtown, it’s a great place to try bicycle commuting. Check out this article we wrote if you’re interested in learning how to start bicycle commuting. Saguaro National Park – Tasha N.
The Loop – Nola G.
Rillito River Park – Nancy S.
Reid Park – Kate T.